Continue Reading Great Spiritual Articles . . . . So please go there and keep reading and learning about Spirituality, Sanse, 21 Divisiones, Spiritual Work, Spiritual, Psychic and Mediumistic Development and more. . . The angel Gabriel is known as the exalted messenger of god ,most of the time when you see images of him sometimes he has a trumpet a scroll in is hand which represent messages or holy orders from god be given to man- kind. Bahá’í Faith texts, specifically in Bahá’u’lláh‘s mystical work Seven Valleys. Many consider him a mediator between heaven and earth. that is why he was chosen to be the patron saint of communication workers in the catholic faith. Women who are trying to have children, will burn candles to Gabriel when they feel they are having hard time conceiving. For it was Gabriel that announced the births of both John the Baptist and Jesus Christ, others ask for his help to interpret dreams. It was this angel that helped Prophet Daniel in the interpretation of his dream-visions. So now sit and think how can this wonderful angel help you in your day to day life. More to come about this beautiful angel later. Many Novenas are dedicated to this saint, She has been known to solve many difficult cases concerning family issues and financial issues. There are families dedicated to Saint Martha because of the miracles and help she had provided and performed. She works hard for those that call upon her. She believes in getting a task done and will work hard to make sure it is accomplished. So make sure that what you ask for is for what really want. Maratha’s focus was so strong on accomplishing a certain task. That Jesus himself had to speak up for Mary Magdalene her sister. I would like to share this story with you about the two sisters. Saint Martha listened to what Jesus had to say. This account can be found in the bible as well too, So you can be assured that she will focus on what is important and get the job done. I offer up to thee this light which I shall burn every Tuesday for nine Tuesdays. when Our Savior lodged in thy house. I beseech thee to have definite pity in regard to the favor I ask (Mention favor). 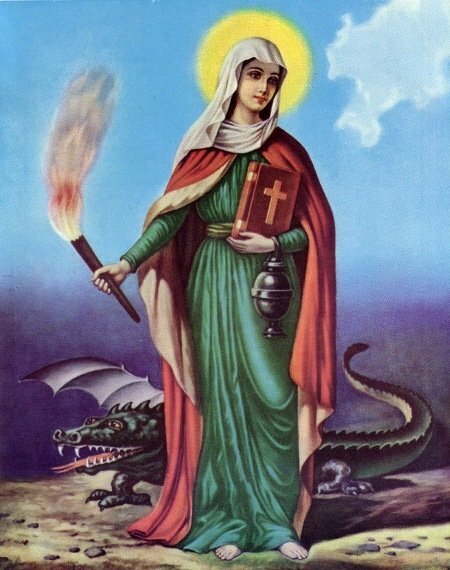 I ask thee St. Martha to overcome the dragon which thou didst cast at thy feet. One Our Father and three Hail Marys, and a Glory Be Amen; and a lighted candle every Tuesday and the above prayer made known with the intentions of spreading devotion to St. Martha. Many Italian St. Joseph’s Day traditions come from the middle ages. During a famine in Sicily, when food was scarce and many people were starving, the poor people had only their faith to rely on. St. Joseph was known as the protector of the Holy Family; thus, Italians with strong family relationships prayed for St. Joseph to intercede for them, in an effort to ensure successful crops. Their prayers were answered, and the famine came to an end. In gratitude, people promised to make annual offerings of their most precious possession – food in St. Joseph’s honor. Italian Catholics and many descendants of Italian immigrants prepare St. Joseph Tables, tavole di San Giuseppe, set to honor St. Joseph. They are filled with beautiful and often elaborate foods, including meatless dishes such as stuffed artichokes, pasta and fish, as well as breads, cookies, pastries, cakes and other delicacies. • Special groups such as orphans, the elderly or the homeless are invited to share in the feast. At the end of St. Joseph’s Day, leftover food is sold or given away, and any money earned is donated to the poor. In the United States, red is worn on St. Joseph’s Day. There doesn’t seem to be any religious significance to this color. It seems to have begun as a tradition to complement the tradition of wearing green on St. Patrick’s Day, which falls only two days before. St. Joseph is the patron of workers and those in need of work. Prayers for the unemployed are often included in the traditions of March 19th celebrations. The high veneration in which the Irish hold St. Patrick is evidenced by the common salutation, “May God, Mary, and Patrick bless you.” His name occurs widely in prayers and blessings throughout Ireland and it is said that he promises prosperity to those who seek his intercession on his feast day, which marks the end of winter. We often hear about Saint Patrick running snakes out of Ireland. Well the snakes really are the pagans that were ran out of Ireland. 1.Did you know that even though green is worn on Saint Patrick’s day, green is not the color of luck at all. Actually wearing green is strictly a U.S. custom, as the color green is considered unlucky in Ireland. Green is connected to the old green flag and a time when Ireland was not free. 2.Those cute little leprechauns are not friendly or happy creatures at all. They are tricksters and like to cause mischief. Everything turns green on Saint Patrick’s day, But what is sad is that people really do not understand the true meaning of Saint Patrick’s day. It is not just about leprechauns and shamrocks. Did you know that the shamrock is a symbol of the Holy Trinity? Well here is a little more about the saint himself Saint Patrick. Who Was Saint Patrick? Saint Patrick, the patron saint of Ireland and one of the most celebrated religious figures around the world, has very little factual information about his life and times most of which is quite vague. Most information about St. Patrick has been twisted, embellished, or simply made up over centuries by storytellers, causing much ambiguity about the real life of St. Patrick. However, there are a some elements of his story a which most scholars accept to be true. According to Coilin Owens, Irish literature expert and Professor Emeritus of English at George Mason University, Saint Patrick is traditionally thought to have lived “between 432-461 A.D., but more recent scholarship moves the dates up a bit.” At the age of sixteen he was kidnapped from his native land of the Roman British Isles by a band pirates, and sold into slavery in Ireland. Saint Patrick worked as a shepherd and turned to religion for solace. After six years of slavery he escaped to the Irish coast and fled home to Britain. Bees are amazing, they each have a job that keeps the hive flowing in a smooth manner. This does not just benefit the hive, but all those who benefit from the bees, their honey, and their work. It is amazing how God put such a small creature in charge of making sure that we have food to eat. Which brings me to the following point: There may be days that you might feel like the small things you do not count. That you and your existence in the world is insignificant. However, we are all interconnected in the world. Even the act of dropping a dime and not picking up could help another person. The simple act of picking up the phone and calling someone can move a person from doing dangerous things to beneficial ones. These small acts can make such a big difference in someone else’s life. Sometimes we feel that we have to do something on a large scale to change something or to make a difference. When, often, its the smallest of acts that can make a huge difference. So keep this in mind the next time you see a bee pollinating a flower. Its a small act but it makes a big impact on us all. Have you ever noticed when you come out of the ocean, you feel so relaxed and refreshed? Some say the ocean is a like being inside the womb. Some cultures say the ocean this is were all life began. Many cultures around the world visit the ocean for healing and cleansing rituals. Even listening to the ocean can soothe your spirit. The ocean is one of the greatest gifts that God gave to man kind. Our ocean has so many healing powers and spiritual gifts, all you need to do is take the time to tap in to them. The ocean is full of mystery as well. It has been reflected in various myths and legends from around the world. There are still places in the ocean that have not been explored by man. In the centuries of exploration and trade, sailors were regarded as explorers in the dangerous expanses of water, adventuring to discover new riches and lands. People knew little of the sea in those times, and little of the lands that it separated them from each other . The ocean possessed an aura of mystery, adventure and intrigue. It was the great barrier that distanced exotic lands. If you allow the ocean to help heal you spiritually she will. Below are few ways the ocean can help you. Always remember to thank ocean for her gifts. 1.Pick up a seashell place to your ear and mediate to the sound. 2.Bring some ocean water home and keep on hand to cleanse your home with. 3.If you have happen to run across some seaweed, dry it out and keep for a spiritual bath. 4.If you having problems sleeping find some, authentic sounds of the ocean and you’ll be asleep sooner than you know it. Music has been around since the dawn of time, in some way, shape or form. Did you know that certain music can give you a clue as to what spirits are around you? Not rock and roll of course. But have you ever listen to a gypsy tune being played on a violin and and hairs on your arms stand up and you get a chill (in a good way of course)? How about listening to a bag pipe being played? Do you feel a urge to get up dance? Perhaps a message might come to you or the feeling of inspiration hits you. In any case this another way that our guides and spirits can communicate with us. Music is a powerful tool which can uplift you and bring your soul so much joy. I find the best way to enjoy a music is to add dance to it. It can be such a such a refreshing and uplifting feeling. Let your body sway and move to the music. Don’t worry about have the best dance steps just move your body to the music. Your spirit and soul will thank you for this time that you take out of nurture it. The medical field is finally catching up with the idea, that music can used heal people and also help them deal with all kinds of chronic conditions. Music is even being used in some hospitals to help patients dealing with pain. This is wonderful news to so many people. So find your favorite song or tune an just have a great, time bonding with your spirits and uplifting soul. Have you ever just took a leap of faith not knowing how things may turn out? How much faith do you really have in God? How well do you trust your spiritual guides? Unfortunately, many have become so caught up in the mundane word that we put more faith in mankind than God. Yes, it is true that God gave us free will to choose, but He also wants us to come to Him in our time of need. More than faith He wants us to have the knowledge that he is there for us. To trust him to handle situations that we put into his hands. But many times we feel that things are not being resolved fast enough and start to doubt that God will handle the situation. God also wants you to have the common sense to know when he is helping you out as well. So keep that in mind the next time you ask for God to help you with a situation. Sometimes He is helping you without you even realizing it. Sometimes the help that he is giving you isn’t in the manner in which you expected, yet it always works. The following poem illustrates just that.